Careware, Sage Manufacturing ERP Specialist, Announced Today Sage 300 Shop Floor Control Module Is Now Available. Petaling Jaya- November 15, 2014. CareWare Systems Sdn Bhd, is an award wining Sage Business partner who has received the Top Manufacturing ERP Expert, Excellence Award for the Sage 300 range of manufacturing modules announced the availability of a NEW Sage 300 Manufacturing modules Shop Floor control that integrate with its flag-ship product Sage 300 ERP 2012 >. Sold & supported by CareWare who specialises in Sage manufacturing solution, it is fully integrated with the Sage 300 ERP financial and logistics modules. Sage 300 ERP - The Manufacturing Shop Floor Control (S/C) module allows users to record time entries and shop transactions of MO operations. It provides detailed production data captured between the releases to receipt of MO order quantity. Shop transactions include the setting up of the work stations to the actual runtime and receipt of operation output. In addition, S/C also tracks the occurrence of station downtime (e.g. machine breakdown) and occasional in direct stoppage (e.g. meetings).The Shop Floor Control (S/C) module effectively replaces the production logs with an online system linked to the MO data for Manufacturing. The S/C provides management with operation status updates and periodic operation efficiencies and work station utilization data. Sage 300 ERP - Manufacturing Order Lot Tracking Add-on (M/L) module fully integrates with our Manufacturing Order (M/F) module and with the lot/serial tracking features of the Sage 300 Inventory Control (I/C) modules. It allows warehouse personnel to define lot/serial tracking information for materials issued,returned and received in the warehouse. By integrating with the Inventory control module, M/L minimizes end user workload in keeping track of lot records. Users now have only one stock balance to keep and one lot/serial tracking record to update. All lot/serial balance and history records are kept within Sage 300 I/C. 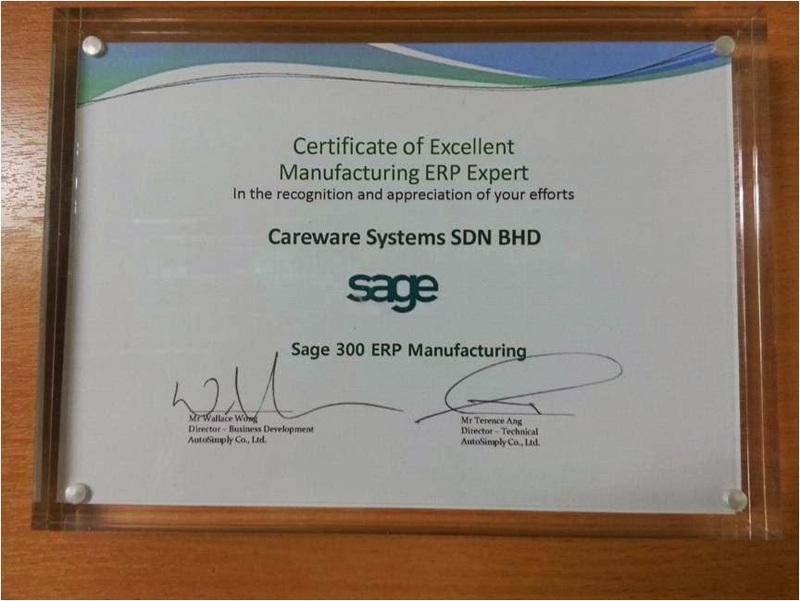 About CareWare:CareWare is the top Premier Partner of Sage Asia and, was awarded the Sage Manufacturing Expert – excellent award in 2013, Asia Top Sage Premier Partner of the Year 2007-2008 and 2014 has been Helping Businesses Grow since 1988.